Like so many working mothers, I feel my life is a constant whirlwind – during the week I'm either rushing to work or out on the school run, while at the weekend you'll find me in a muddy field cheering on my son while he plays football. Not that I don't enjoy being busy – I positively relish it – but it can sometimes be hard to switch off while I'm away. 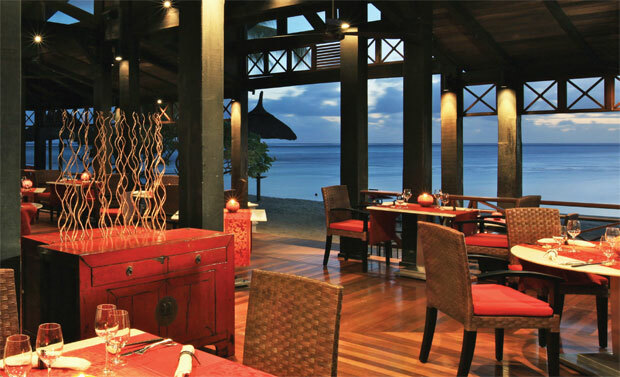 Not so at Heritage Le Telfair, a luxury five-star resort in Domaine de Bel Ombre, on the unspoilt south coast of Mauritius, that's a magnet for British honeymooners. Time almost seems to stand still as couples glide serenely from the beach to the pool and back again, no longer encumbered by pre-wedding jitters and those never-ending to-do lists. 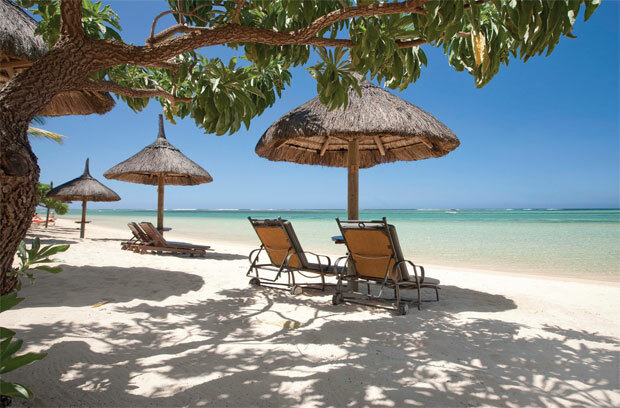 There are two main ways to get to Mauritius – a 12-hour direct flight from London with Air Mauritius or British Airways, or two six-hour flights with Emirates, broken up by a short stop in Dubai. If the latter is your route of choice and – indeed – the way I travelled to Mauritius, my suggestion would be to spend a couple of days in the thriving Middle-Eastern metropolis of Dubai for an exciting twin-centre honeymoon. 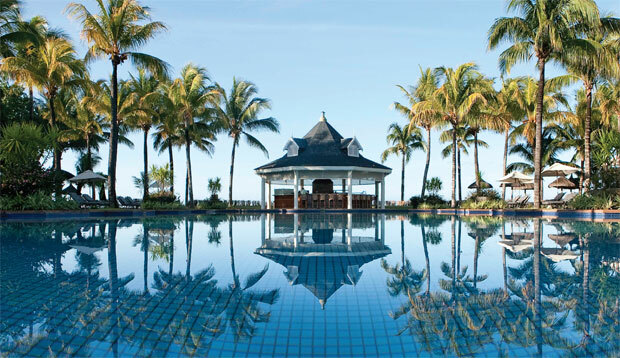 Once you touch down in Mauritius, the transfer to Heritage Le Telfair is a perfectly manageable 45 minutes, long enough to enjoy the stunning scenery but short enough that you're pulling up to the stylish reception before you know it, with its fabulous views across the swimming pool to the ocean beyond. A cooling hand towel and refreshing lemongrass juice proved the perfect pick-me-up before exploring the impressive accommodation. 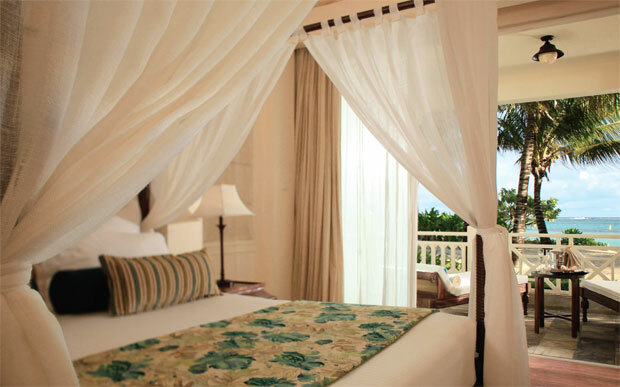 There are five grades of room at the resort, with the Junior Suites providing more than enough space for newlyweds. A central four-poster bed dominates the room, which boasts cavernous wardrobes, a chaise longue, desk, and not forgetting a well-stocked Nespresso machine if you're partial to a kick of caffeine on waking. The bathroom is – frankly – enormous: there'll be no fighting over the sinks – there are two, no arguing over the showers – there's one inside and one outside, and definitely no falling-out over who gets to use the roll-top bath – it's big enough to share! Luggage duly dispensed with, I immediately headed out to explore the stunning 2,500-hectare site which, aside from Heritage Le Telfair, is also home to Heritage Awali – an all-inclusive resort, as well as Heritage The Villas. Foodies will be in their element here, as there are three gourmet restaurants on-site including Gin'Ja, which offers delicious Pan-Asian cuisine and Annabella's, the hotel's signature eatery. An extra special mention also has to be given to Zafarani at Heritage Awali, where a young chef from the North of India is gaining wide acclaim for his exciting, innovative and utterly delicious menu. Honeymooners also have the opportunity to request a private dining table for two at a location of their choosing – what could be more romantic than feeling the soft sand under your feet and the Indian Ocean as your backdrop? The beauty of Heritage Le Telfair is that, even when full to capacity, there's no unsightly scrum for the sunbeds. This means that you can sleep in to your heart's content, safe in the knowledge that whatever the time of day you can take a leisurely stroll to the pool or beach and choose from a range of comfy seats and sofas, many roomy enough for two. Aside from the main stretch of beach, which offers the perfect vantage point to view the spectacular Mauritian sunsets, couples are also welcome at C Beach Club, which is home to a popular kite-surfing school and offers guests a myriad of complimentary watersports facilities including kayaks and pedalos. One of the jewels in Heritage Le Telfair's crown has to be the Fréderica Nature Reserve, where plans are underway to offer newlyweds the opportunity to picnic in privacy at a panoramic viewpoint, while scanning the cloud-free skies for the elusive Mauritian kestrel. Travelling by 4x4, I enjoyed a 90-minute tour of the stunning site, where I was lucky enough to spot a fruit bat, deer, parakeets, partridges, wild boar and even a mongoose. Stopping part way, the short walk through woodland to an impressive waterfall provided the perfect opportunity to stretch my legs, and it's the ideal backdrop for honeymoon selfies. If you're feeling the heat, the plunge pool below the waterfall is inviting enough for a dip, but – be warned – the water's decidedly chilly! Beyond the sandy beaches and turquoise waters at Heritage Le Telfair, there's plenty of adventure on the island to excite thrill-seeking newlyweds. Seakarting, for instance, is exclusive to Mauritius and should be top of your to-do list, if you fancy an exhilarating ride on the open seas. Alternatively, head to Casela Nature & Leisure Park, home to the longest zip line circuit in the Indian Ocean. The highlight has to be the 400m zip line, offering adrenaline seekers a 22-second free-flight experience – not one for the faint-hearted! The best thing about embracing a day of activity is that a follow-up trip to the Seven Colours Spa is a guilt-free and completely justified reward for your exertions. Both Heritage Le Telfair and its sister hotel Heritage Awali offer indulgent treatments that will soothe aching muscles and boost you back up to cloud nine, where no doubt you've been floating since your big day! Ideal for newlyweds, the private 90-minute massage class provides expert guidance in the basic techniques, helping you and your loved one to relax long after the honeymoon's over.